By Edgefield Advertiser on November 10, 2014 Comments Off on Singing, Snow and Santa will be Filling the Air! 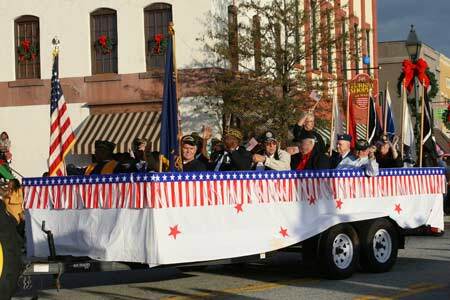 The 41st Annual Edgefield Christmas Parade will be on Sunday, December 7, 2014 at 4:00 p.m. Our 2014 Grand Marshal is Mr. J. P. Calliham, Owner and Operator of Calliham’s TV & Furniture for 62 years. Bring the family and enjoy special entertainment before the parade, beginning at 1:00 pm, on the Edgefield Town Square. If you are interested in entering the parade, entry forms may be obtained from Edgefield, Johnston, and Trenton Town Hall and exploreedgefield.com. Entry forms are due no later than Wednesday, November 19th. There will be snow on the square! Bring the camera for a perfect family holiday picture by the town Christmas tree. For more information you may call Calvin Henderson at 803 – 480 – 1255 or Edgefield Town Hall at 803 – 637 – 4014. Many Thanks to our Sponsors for the 2014 Parade: The Town of Edgefield, Johnston Railroad Diner, Titan Farms, SRP Federal Credit Union, Aiken Electric Co-Op, Pendarvis Chevrolet, Jim Satcher Motors, Mr. Rooter, The Ridge Parts & Supply – NAPA, Herlong Ford/Chevrolet, Edgefield Mini Storage and Trenton Self Storage.